"Australia's first Solar Powered Tramway (2014)"
Operating every weekend during April, the Victorian April School Holidays 6/4 to 22/4 and Anzac Day 25/4. The Floral Tram remains on display in the depot. Ride an authentic Ballarat tram [most over 100 years old] which ran Ballarat's public transport until 1971. Buy real tickets from our volunteers in authentic uniforms. Travel as people have been doing since 1887 on 1.3km of original track through the beautiful Botanical Gardens on the west side of Lake Wendouree. Return trip 20 minutes. Also (Hop-on / Hop-off) All Day: Adult $8, Children $4. Tickets: Cash Fares on the tram, EFTPOS at the depot. When: Trams run every Saturday, Sunday, public holiday and during the Victorian school holidays. 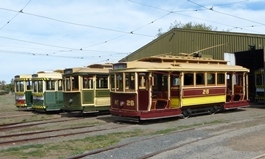 Trams run in Wendouree Parade between 11.30am and 4pm. Our display area at the depot is open from about 11am on operating days and on Tuesdays between 10am and 5pm subject to volunteer availability. Our heritage tram service maybe suspended on days when the temperature exceeds 35 degrees. February 20 - December 2018 issue of Fares Please! added. January 29 - Floral Tram launch 2pm Sunday 24 Feb. added. December 20 - October 2018 edition of Fares Please! added. December 08 - 2017-2018 Annual Report added. October 13 - August 2018 edition of Fares Please! added. August 18 - Floral Tram Project Newsletter No. 2 added to the Floral Tram page added. August 13 - June 2018 edition of Fares Please! added. June 30 - Running hours for July and August changed to 11am to 4pm. June 30 - April 2018 edition of Fares Please! added. June 30 - Floral Tram Project Newsletter No. 1 added to the Floral Tram page added. June 03 - Floral Tram Workshop and Webpage added. June 02 - Jolt Media's 3D tour of Tram 14 added to the web page of Tramcar 14.